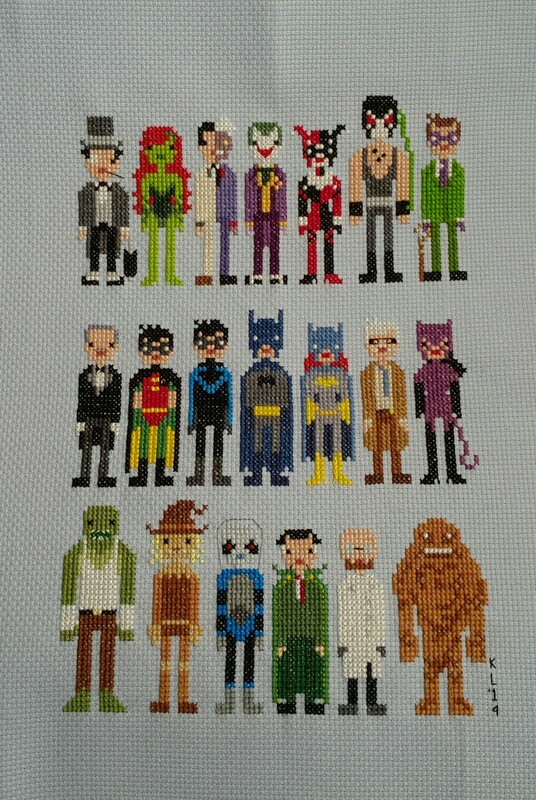 I finished my epic Batman sampler with all of the Wee Little Stitches bat-patterns! There are of course a few changes here and there and some mistakes I won’t point out (because they don’t matter): I used gold for the Riddler’s cane head and I added chest hair to Bane on Penny’s suggestion because it’s hilarious and I would think Bane has lots of hair. Clayface and Two-Face were the most difficult, and Joker has the most colors at something like 15. Commissioner Gordon might be my favorite here, because he just looks exactly like the animated series Gordon, and the colors are spot on. The crooked tie and glasses! Each one took about an hour on average, give or take. Clayface took the longest and Dr Strange was probably the fastest, or Catwoman. I will have it framed soon and probably put it in the boy’s room. :-) One of these days I’ll frame them myself, but I get some great coupons at Michaels now and then, and that’s just easier.